Jodhpur RIFF is a not-for-profit partnership project involving two of India’s leading heritage trusts: Mehrangarh Museum Trust and Jaipur Virasat Foundation. The festival has been endorsed by UNESCO as a "Peoples" Platform for Creativity and Sustainable Development." HH Gaj Singh of Marwar-Jodhpur is the Chief Patron of Jodhpur RIFF, Sir Mick Jagger, front man of the rock band The Rolling Stones is International Patron of Jodhpur RIFF. John Singh and Jaipur Virasat Foundation. Kachi Ghodi - A dance form, central to which is a colourful dummy-horse in which men in elaborate costumes dance rhythmically to beating drums, under a large umbrella Chhatar Kotla - while a singer narrates the exploits of the Bhavaria bandits of Shekhawati. Bahrupiya - The artful, disguise specialist and performer par excellence – the ultimate con-man! Jogi Kalbeliya Nritya – The Kalbeliya dance is probably the best known of all Rajasthani dance forms. Snake worshippers and charmers, the Jogi Kalbeliya are masters in everything to do with snakes – in fact, their dance moves are based entirely on the fluid movements of snakes. Young musicians from the Langa community – The Langa are a professional musician community. They are either 'sarangiya' Langa, who can sing and simultaneously play the exquisite Sindhi sarangi - or the 'surnaiya' Langa, who play the algoza and other woodwind instruments. Trained by their 'ustad', the young, budding masters of the community will share their music and inspire school children as they continue to uphold the legacy of their forefathers. Phad – an ancient form of folk painting, now slowly dwindling, will be presented along with the dramatic storytelling that accompanies the revelation of these scrolls. Kavad – The enchanting world of kavad is where a beautifully illustrated box opens out like Alice’s wonderland telling stories both old and new. The storyteller or kavadiya bhat unfolds each panel, narrating mythological and historical stories with the music of the Kalbeliyas. Chang Nritya – Native to the Shekhawati region of Rajasthan, this exclusively male dance will make you reverberate to the beats of the chang (daff drum), ghunghroo, manjira and bansuri. Watch the dancers make beautifully rhythmic patterns to the deep sounds of the chang. Jodhpur RIFF's festivities will be kicked off by a two and a half hour variety program of traditional Rajasthani music, also featuring excerpts from our main stage performances and ending in a rousing finale with drummers and dancers. The concert opens with Lakha Khan Manganiar, a legendary folk singer and sarangi maestro. Though the sarangi is not a traditional Manganiar instrument, he has put his own stamp on their traditional repertoire with his mastery of this instrument. A group of talented young musicians from the Barmer and Jaisalmer districts will be performing next. They truly are Thar ke Sitaare. This group will present a short excerpt from a longer programme which will be featured in the Desert Lounge at Rao Jodha Park. Shafi Sopori, a mesmerising Sufi singer from Kashmir, also featured in our Main Stage performances will be taking the stage as well some of our international artistes.. The finale will feature a special collaboration between a drum section with the dusha (traditional war drum) and the dhol (double sided drums) and a select few dance forms of Rajasthan such as the Chari, Jogi Kalbeliya and Agni Bhawai dancers. The Meghwals of Marwar herald in the first dawn at Jodhpur RIFF, every year. Early in the day, a serene morning, the melodic drone of the 'Tandura', the beat of the Jhanjh/ Manjira (small-paired cymbals) and the rhythm of the Dholak create the mood for the meditative strains of the bhajans of the Meghwal community, sung in praise of their Guru/ saint Ram Dev ji. This year we have the exquisitely meditative and masterful Mahesha Ram, Bhallu Ram and Tamachi Ram singing the poetry of popular poets of their community and form Rajasthan. Note : There will be free guided walks available in the Rao Jodha Desert park after each dawn concert. Jodhpur RIFF presents its very first rustic dance ‘bootcamps’, facilitated by noted trainer and danseuse Ada Kyra. Short, intense and very rigorous, these camps will give participants an experiential insight into the movements and practice of these dance forms. Kalbeliya & Ghoomar are two well-known, magnificent traditional dance forms having their roots in Rajasthan. Ghoomar, originally a Bhil tribal dance in praise of Goddess Saraswati, is now a popular, ‘must have’ in any Rajasthani family celebration. It typically involves delicate wrist movements and performers twirling while moving in and out of a wide circle (the word ghoomna means “twirling around” and is the basis of the word ghoomar). The Kalbeliya dance form can be equally delicate or vigorous. It is the traditional dance of the Kalbeliya community, emulating the movements of snakes. We invite you to embrace the rustic beauty of these dances in the company of Samdha and Deepika Kalbeliya... learn some key arm and wrist movements, spins.. celebrate those twirling waists and let loose… in the musical air of Jodhpur RIFF! Participant requirements: Free, flowing comfortable clothing… T-shirts or long, loose shirts or blouses, stretchable and loose track or harem pants or long skirts. A hand towel. Each Kalbeliya & Ghoomar session is a stand-alone; participants can come for any one session. All three boot camps have limited capacity. Do carry your own wiping material (towel, wet wipes, etc.). Be prepared to sweat! It is a boot camp!! No prior dance experience required. No observers will be allowed, just the participants. Drawing on its rich musical and Sufiyana heritage Mohammed Muneem (singer-songwriter, poet and composer and frontman of Alif) and melodious vocalist Vibha Saraf give us a glimpse of their love and experience of Kashmiri music. They will be talking about the different musical traditions of Kashmir and what it means to Kashmiris and how music creates the space for dialogues to happen when it is needed most. Jodhpur RIFF's interactive session series give the audience a rare opportunity to meet fascinating artists from various root traditions.The sessions encourage visitors to engage with them and chat about various folk instruments, forms and communities through their performances, demonstrations and facilitated interactions. As more and more of Rajasthan's and India's rich traditional cultural heritage disappears Jodhpur RIFF puts the spotlight on some of our remarkable music forms and traditions nearing extinction. Suguna Jogi hails from the village of Samrau, near Jodhpur. She belongs to the Jogi community, who have traditionally been experts on snakes, their handling, capture and care. This is the community from which the popular Kalbeliya dance form comes and she is one of the senior-most custodians of the vocal traditions that accompany the dance. Suguna ji is among the last few people alive who remember the ancient musical forms that are sung before the dancers begin to perform. Inspite of setbacks in her personal life, Suguna ji continues to perform across the globe with passion and verve. She has a charming but powerful presence and her voice is as unique as the art form she keeps alive. Dapu Khan ji is an stalwart of the kamaicha. Hailing from the village of Bhadli, near Jaisalmer he has been a regular presence at the Queen’s Palace in Jaisalmer fort for the last three decades. He comes from the Miraasi community, who believe they are descended from the Gandharva musicians who performed in Indra’s court. Dapu ji was taught to play the kamaicha along by his father. The story goes that the entire neighbourhood would come to a standstill when the young Dapu played in the evenings. From there he has gone on to continue to learn about the instrument as well as his musical lineage as well as teach it to his son and nephews and others who want to learn to keep this instrument alive. 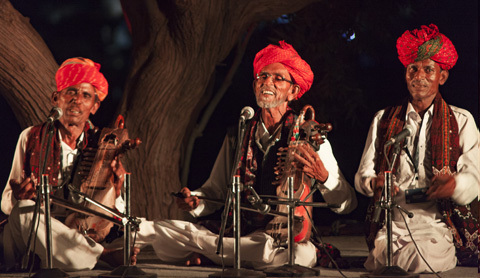 He has enthralled audiences from all over the world at Jaisalmer fort. He has won the admiration and patronage of the Jaisalmer royal family, the Rajasthan Tourism board and many others for his skill and dedication to his heritage. In its present form, the Kamaicha has 10-17 strings and is played with a bow. A typical Kamaicha is made of mango wood, its rounded resonator ‘tumba’ is covered with goatskin. The playing strings (3-4) are made of goat intestine -‘roda’ and ‘joda’ while the other 14 sympathetic strings are made of steel, called ‘jhara’. The Kamaicha is different from its Iranian counterpart called ‘Kamanche’ (a spiked fiddle with a smaller body and no resonant strings). The Kamaicha’s bow is prepared from ‘Khejari’ wood and horse tail hair. Occasionally, small bells (ghungroo) are attached to the bow to produce a rhythmic jingle along with the notes. Mohini Devi will open the Main Stage performances of this year’s festival with a presentation of traditional Jogi (also known as the Jogi Kalbeliyas) music. Mohini ji is an enthralling singer who hails from the Jogi community in Daijar, near Mandore. She is one of the few female singers left who carries on what used to be a robust musical tradition in the community. The women of the gypsy-like Jogi community used to sing along with the serpents the community is famous for handling. When the practice of catching and raising snakes were outlawed under wildlife preservation laws the women slowly began dancing to represent the snakes that were an integral part of their culture. Over time the Kalbeliya dance form has overshadowed the musical traditions of the Jogis with only a few women left who remember and perform these disappearing songs. What is also a remarkable is that not many women vocalists can match the high pitch of the been (pungi), the reed-like instrument which is a hallmark of the Jogi Kalbeliya the way Mohini ji can. Her astoundingly unique voice and passionate presence make for a wonderful performer. Makan Ashgvari refuses to be categorized. A singer-songwriter, actor, director and teacher living and working in Tehran. His sound is as eclectic as his passions – combining electronica with spoken word, jazz and pop, he takes his audiences on a journey as personal as it is communal. He puts the Persian sounds of his heritage (the poetry, music, folk forms and instruments) into frame that evokes his own modern day experiences of growing up in Teheran. He has been performing with rock bands such as Dash, with the jazz band Naima and with the independent experimental music band Bomrani. He has worked with theatre directors such as Sajad Afsharian and Hamid Pourazari and directed his own theater productions with musicians and actors. Jodhpur RIFF presents 'Desert Lounge' in the Rao Jodha Desert Park, just outside the Mehrangarh Fort… an unusual, acoustic, moon-lit rustic experience under the stars with musicians in this stark yet beautiful environment - Sumitra Das and artists of Mehfil-e-Thar bring the night alive. The night begins with vocalist Sumitra, a hugely popular singer who specialises in bhajan sangeet and other forms of traditional Rajasthani music. She's been featured at JRIFF and other festivals in India and abroad and has collaborated with spectacular composers and performers like Ram Sampath. Her husky alto and powerful throw will create a magical ambience under the moonlit desert night. She will be followed by Mehfil-e-Thar where a motley group of extremely talented artistes from the Barmer and Jaisalmer districts will present a rare repertoire of songs on nature, changing seasons, love and the events and celebrations that mark important milestones in the lives of desert dwellers. It will be a rare glimpse into the way music and life are so highly integrated in these communities. Please note: The meeting point for the Desert Lounge for all audience is in the Mehrangarh Fort lower car park at 10.45 pm or at the entrance to the Rao Jodha Park at 11.00 pm. The walk to and from the performance space is approximately 10-15 minutes from the lower car park: first on the road to the Rao Jodha Park entrance (5 minutes) and then in the park itself (5-8 minutes) – so please wear decent shoes for walking! Please carry something warm (it gets chilly); hot drinks & light refreshments are available for purchase. As the music is acoustic (non-amplified) and the space is intimate, any noise might make it hard to hear vocalists and distract fellow audience members. We would greatly appreciate it if the audience refrained from chatting and speaking on phones during the performance. You could step away from the seating area to do so. IN RESIDENCE I - Kahaniyan Kahan Hain? All festival passes are strictly non refundable and non-returnable. The 'day pass' and 'full festival pass' holder is allowed entry into the Mehrangarh Museum. However, it does not entitle the holder to food and drink, both of which must be purchased separately as per advertised prices. Video cameras, recording devices and flash photography are strictly not allowed at any Jodhpur RIFF events and venues. Jodhpur RIFF reserves the right to change venues and events without prior notification. Registration is required to purchase Donor Passes. On clicking the link below you will be taken to the registration and Donor Pass purchase pages. Purchase of a donor pass will imply acceptance of the above terms. Hidayat Husain Khan is the youngest son of Ustad Vilayat Khan and has music in his blood. His is a rare musical brilliance that allows him to effortlessly cross musical genres and styles. An exquisite sitar player and vocalist well-versed in the ‘Gayaki ang’, a unique rendition where voice blends with the instrument, Hidayat Husain Khan carries the torch of a coveted lineage spanning seven generations of outstanding vocal and instrumental court musicians. The legend of Meera Bai and Rajasthan are deeply connected. What kind of a connection is it? How have the oral and musical traditions of Rajasthan and india been influenced by Meera and vice versa? How have different communities in Rajasthan brought Meera into their musical and historical traditions? These questions and more will be explored by artistes from the Meghwal, Manganiar and Kamad communities (among others) in conversation with renowned folklorist Padma Shri C.P. Dewal. Accomplished Jaipur-based vocalist Manesha Agrawal returns to Jodhpur RIFF (last seen in our first festival in 2007) serenading us under the rising moon with songs of love, longing and celebration in the traditional maand gayaki.. This is a classical style of Rajasthani music similar to the thumri or dadra. Manesha’s sound training in both Hindustani and maand make her performances an auditory treat for the listener. Every year JRIFF has attempted to showcase the particular musical traditions of one of the diverse communities of Rajasthan. This year we bring together the most senior and respected maestros from the Langa community, for a performance resplendent with their virtuosity, talent and passion - in rtheir epertoire and in their instrumental prowess. The Langa are a community of professional musicians trained as genealogists and singers, playing the inimitable Sindhi Sarangi (a unique stringed instrument) and wind instruments such as the algoza, murli, etc. The programme features the legendary Kader Khan Langa on the Sindhi Sarangi and vocals, Nek Mohammed Langa and Bundu Khan Langa on vocals, Noor Mohammed Langa on the Sindhi Sarangi, Meherdeen Langa on the Sindhi Sarangi, Murli and Sataara and Asgar Khan Langa on vocals and harmonium. These veterans will be joined by promising young artists from the Langa community as well. All the way from Portugal, Ana Pinhal brings to India the sweetly melancholic repertoire of the fado. Fado is an oral tradition of music from Portugal which is usually characterised by longing and sadness. It is an intense experience that draws the listener into the inner world of the singer and the story. Ana is a renowned fadista who brings her wide experience and passion for this art form, with additional experience in a variety of other forms… as a trained Bossa Nova singer and later as backing vocals for Boite Zuleika, a band based in Porto; as a co-founder with Francisco Almeida (flamenco guitar) on the Fado Violado project - a project that intertwines fado and Flamenco. Winner of many South African Music Awards and a two-time Grammy nominee and winner in 2016, world renowned flautist and music composer, Wouter Kellerman performs with his band at Jodhpur RIFF 2018, consolidating his collaboration with young Rajasthani artists that began three years ago. Kellerman has focused his attention on roots, world and jazz music, exploring the versatility of his instrument and drawing from the deep tribal and folk traditions of Africa, fusing them with classical and contemporary sounds. He will be joined by Dharra Khan on the kamaicha, Bhutta Khan on vocals, Zakir Khan on khartals, Shakur Khan on the algoza and morchang, Idu Langa on the algoza and Papa Mir on the dholak. Alif - the first letter of the Arabic Urdu script, signifying oneness, the mystical and the unseen. These are some of the interpretations the band brings forth in their poetry and sound. Based in Pune and founded by Mohammed Muneem, this is a band that brings lived experience to the stage. Muneem is a vocalist, poet, an MBA and artiste from Kashmir. Deeply influenced by the folk music of Kashmir, he is the inspiration for the band and its sound-both soothing and haunting. Formed in 2008, Alif's poetry and music is relevant and bold. When masterfully blended with Alif’s distinctive genre-defying contemporary and ethnic sound, the experience is profound. Winner of numerous awards (IRRA award "Best Music Production" for Like a Sufi; Winner of the Dada Saheb Phalke Film Festival 2018's "Best Music Video" for Lalnawath) Alif is an experience that both stirs and stills the soul- and ultimately, sets you free. Muneem is joined by Hardik Vaghela​ on keyboards, Chaitanya Bhaidkar​ on guitars, Karan Chitra Deshmukh​ on percussion and Amit Gadgil​ on bass. Jodhpur RIFF is honoured to present Jose Marquez's India festival premiere appearance at Club Mehran. Los Angeles DJ/Producer Jose Marquez’s musical influence is a result of being brought up on a stable diet of Latin and World Music. Always intrigued by electronic sounds, Jose's mission has been to fuse his love of world rhythms with the dance floor. Jose indeed succeeded when he burst onto the scene in 2010 with memorable remixes & edits of artists such as Celia Cruz, Nina Simone, Oumou Sangare and many others. Since then, he continues to travel the globe uniting nations on the dance floor with his signature sound performing at major clubs and events such as Djoon (Paris), Global Fantasy (Athens), Solid Garage (Toronto), DEEP (Los Angeles), Crossroads (NYC), etc. He is a groovy, in-the-pocket, make-you-move DJ! IN RESIDENCE II - Where do we go from here? One of the most famous thumri singers of our times, Vidya Rao's elegant demeanour hides a surprisingly mischievous streak. That spark of mischief is palpable in the way she approaches her gayaki. She combines the delicacy of shringar with the robustness of the Bhakti poets in her nuanced vocals, glissading voice presenting the nirguni ang of the form as dawn breaks over the fort. She was trained by Smt. Naina Devi, and Smt. Girija Devi among other doyens of music. The program is subject to change. There will also be screenings of films at Jodhpur RIFF. Please watch out for details of venue and timings on our Facebook page in early October and at the venue. Entry will be free. Pempe Khan will be starting this unique dawn concert with the plaintive notes of the surnai welcoming us to the morning. This maestro has enthralled audiences at RIFF for many years and will be featured in a premiere solo performance. This will be followed by a unique jugalbandi between the young ustads Asin Khan Langa on the Sindhi Sarangi and Dharra Khan Manganiyar on the kamaicha. This is the first time such a focussed collaboration has taken place and they will be singing and playing devotional music from both communities traditionally used to greet the dawn such as prabhaati, heli, fakiri and bhajans along with Talab Khan on vocals and Firoz Khan on dholak, and will deliver the saar or essence of their folk traditions. Jodhpur RIFF invites you to the wonderful world of the belly dancer, one which carries an unique vibe as the dancer gently unleashes a divine feminism from within while discovering and exploring the sensual movements of her body. The grounded, graceful and gifted danseuse Ada Kyra will not only teach you the techniques of belly dancing but will also share the philosophy behind the origin of this dance form. An introduction to various style of belly dance such as the oriental, the tribal, the khaliji, the taqseem and more... get ready to shed all your inhibition and some calories thanks to some intense hip shimmies, snake arms, maya, chest isolations… come and rediscover your body and soul! Participant requirements: Free, flowing and 2-piece comfortable clothing… tight T-shirt or spaghetti strap tops. A stretchable bottom like track pants, harem pants or skirts. A hand towel. The Belly Dancing session is for women only. All three bootcamps have limited capacity. Bush Gothic, perform their unique oeuvre of sung-stories. Defiantly modern, achingly old, this daring Australian bush band from Melbourne, Australia perform songs of criminal women and desperate men from an era of transportation, adventure and gold. Fiddle-singer and band leader Jenny M. Thomas has been described as an ‘Edgy rising folk star’. Along with double bassist Dan Witton and drummer Chris Lewis they toured the UK and Ireland in 2016 & 2017 with sold out concerts in London and Fringe First awards in Adelaide. RIFF looks forward to hosting their electric performance this year. A unique Welsh-Indian collaboration begun at Jodhpur RIFF in 2017 comes back this year in a new format. Paying tribute to the age old tradition of telling stories and singing songs around fires on dark nights, RIFF 2018 will see the first such Round house session where Welsh and Indian storytellers and singers will weave together stories and music from both oral traditions as day turns to night in the ancient fort. Mesmerising story teller Angharad Wynne and composer,singer-songwriter par excellence Gwilym Morus-Baird will create a tapestry of story and song together with classical Sufi singer Smita Bellur, master kamaicha player Dharra Khan Manganiyar, percussionist Sawai Khan Manganiyar, and others. The pieces featured in this performance have been developed at RIFF 2017 and in festivals in Wales and England as well. This collaboration has met with great acclaim and admiration and we are proud to have come full circle with these wonderful artists once more. She is a prolific composer, dazzlingly versatile vocalist and staunch supporter of artistic excellence. Jodhpur RIFF 2018 is honoured to be hosting a unique performance of Shubha Mudgal’s Baramasa: A Year in Song, an exploration of a special repertoire of compositions on the theme of seasons of the mind, body and spirit as extracted from baramasa poems in Brajbhasha, Awadhi and Urdu literature. Baramasa poems narrate in exquisite detail the pangs of longing and separation experienced by the protagonist through the ‘barah”/twelve ‘masa’/months of the year, juxtaposed against elements of the seasons and nature. Shubha ji presents a selection from a variety of ancient and medieval sources as well as from collections published by researchers and scholars. She will be joined by Aneesh Pradhan on the table. Aneesh ji is one of India’s leading tabla maestros and is much sought after as both an accompanist as well as solo artist. Sudhir Nayak will accompany them on the harmonium. Tiloun Ramoune brings the magic of Maloyan rhythms to Jodhpur RIFF 2018. Immersed in the land and soundscapes of Réunion, Tiloun gives new life to its traditional lyrics and music. His is a voice, both fragile and striking, telling us about Réunion, its spirit and the meeting of language and heritage. Inspired by the legendary Alain Peters, Ziskakan and Henri Madore, Tiloun travels the world sharing his joy and experiences through all that is Maloya. Tiloun appears at Jodhpur RIFF courtesy a very special, long-standing relationship with IOMMA (Indian Ocean Music Market) and Scénes Australes supported by Region Réunion and the European Union. Sawan Khan Manganiyar stands tall as a Sufi singer in Rajasthan. His awe-inspiring voice and sheer depth of knowledge make for an unforgettable listening experience. He hails from Dabdi, a small village near Jaisalmer and learnt the basics of Sindhi Sufi gayaki from his father Bhikke Khan. His passion led him to further hone his craft under the tutelage of Ustad Bhikey Khan in Sindh, Pakistan for 8 years. He now travels the globe singing primarily in Sindhi and introducing audiences to this distinct genre of music. His repertoire includes poetry and music by Shah Abdul Latif Bhitai, Bulleh Shah, and Ghulam Farid among others… bringing to us a concert of some truly rare musical jewels. Based on a rigorous knowledge of the tradition and orally transmitted songs, Olaia Maneiro, Sabela Maneiro and Aida Tarrio meet together in a unique encounter where magic, naturalness, spontaneity and musical communion hit us in the very first few seconds. Accompanied by remarkable musicians, Jose Diaz Iglesias (double bass) Ruben F. Monteagudo (accordion), these unique artists present a repertoire of carefully chosen themes and a treatment that transport us to the town of Santiago de Compostela, where the world of the tambourine and the dances of Galicia come together. RIFF RUSTLE with Gene Peterson, Rajasthani artistes and international percussionists, musicians and singers from Jodhpur RIFF 2018! RIFF Rustle, our largest, impromptu collaboration event that concludes the festival's night time revelries. Every year, the festival appoints an musician as a 'rustler', who then rustles up other musicians from the festival to participate in this performance in pairs or quartets or all together. This year Gene Peterson will be our "rustler" with a twist. Not only is he going to gather musicians to come and jam he's also going to be collaborating with some Rajasthani musicians and curating a set for the Rustle! Gene is an extraordinary drummer, pianist and composer from Australia. As a musician, he is a virtuosic percussionist, an exceptional pianist, and a masterful entertainer. He has toured throughout Australia, Europe, Asia, America & the Middle East. He has featured at a variety of major festivals including the Sibiu International Theatre Festival (Romania), the Singapore Arts Festival, the Holland Dance Festival, the Adelaide Fringe Festival and the Brisbane Festival (to name just a few), and is renowned for his fresh and exciting approach to live performance.may rarely meet again. Expect to be on your feet and dancing like never before with this show! Purchasing a donor pass implies acceptance of the terms listed below. Please read the terms carefully before purchasing your donor pass. The festival pass is transferable, however any attempt to resell it at a higher price will lead to the bearer being refused admission to the festival. All festival passes are strictly non-refundable and non-returnable. The price of the full festival pass includes entry to the Mehrangarh Museum, all RIFF Dawn concerts, In Residence, Moonrise Concert and events after 5 pm during the festival. It does not include any food and drink, both of which must be purchased separately. The price of the day pass includes entry into the Mehrangarh Museum, RIFF Dawn concert, In Residence and events after 5 pm on the date for which the pass has been purchased. It does not include any food and drink, both of which must be purchased separately. All digital or analogue, professional or semi professional photography, videography and recording are strictly prohibited. Video cameras, recording devices and flash photography are not allowed at any Jodhpur RIFF events and venues. Jodhpur RIFF reserves the right to change venues and events without prior notification. Updates will be available at the earliest on the Facebook page and on site. For security reasons, all entrants to the festival may be searched. Jodhpur RIFF and Mehrangarh Museum Trust reserve all rights of admission. The person using a festival pass takes all the responsibility for personal injury, and loss of or damage to property. You maybe filmed or photographed by our official photographers during your visit to Jodhpur RIFF. The footage and/or images may or may not be used in future promotional release(s). By purchasing any festival pass, you agree to this and grant us permission to use your likeness in said releases. In cases of disputes, the decision of the patron is final and binding. The jurisdiction for all legal matters will be Jodhpur. Children below the age of 12 yrs are allowed free entry. Proof of age may be requested. Children are not allowed near the bar area. Vendor Transaction Fee is applicable. Copyright © 2016 Jodhpur Riff.